Must leaders have all the answers? While being able to answer the many questions received each day has served leaders well, we know having an answer to ALL questions is an unrealistic expectation. This is especially challenging for leaders operating in today’s complex, uncertain, and ambiguous world. Instead, imagine a world where leaders spend more time asking questions than answering them. This is where the leader as a coach thrives. Connie Whittaker Dunlop currently serves as the Executive Director for Professional Advancement at the University of Virginia Darden School of Business. In this capacity, Connie teaches the required Professional Advancement course and the Leadership Coaching elective. 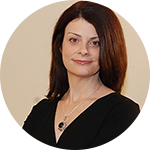 She is recognized as a Professional Certified Coach (PCC) by the International Coach Federation and has a proven track record of coaching more than 1,000 executive and residential MBAs. She is known for her deep listening skills and her ability to ask powerful questions which drive insight and action. Connie joined the Darden team in 2007. Prior to Darden, she served as an internal human resources consultant with Capital One and a manager with Deloitte’s strategy and operations practice. Connie is a candidate for George Washington University’s doctorate of human and organizational learning. She earned a Darden MBA in 1998. Forté webinars are produced for the benefit of our members. Information provided on this webinar should not be reproduced, distributed or published without the written consent of Forté and permission from individual speakers. If you wish to use our content, please contact Forté for permission.